So lets get into some first things first… I have reached a point where I am going to go a bit slower on the pages here. What this means is, I am going to slip back and go to weekly blog posts. The sad thing is, I am not really writing the blog for money so I need to go to the places where I am better able to support the world I live in. This means I am going to be focusing more on the fiction outside of this blog. Of course, there will still be stuff that pops up from time to time here, but this is more a place for thoughts on the various interests I have and how they interact within my life. Look for posts to come about on Wednesdays. With that said, I am stepping into one of the bigger things going on in the my odd and strange world. I imagine if you have read the pages here for a long time, you may notice that I switch up what I am digging through at any given time. The main gist of that is exploring the various interests that fuel the writing and feeding my creative garden. Which brings us to a bit of the gaming stuff we have been exploring lately. I am sure I have mentioned it in the past but I will say it again. I have been a gamer for the majority of my life. Whether it be video games (started with actual arcades and a Commodore 64), pen and paper games, or even board games, they have been with me for about as long as I can remember. There is a reason monopoly isn’t allowed anywhere near my house in any way shape or form… Yeah, we played it a lot when I was growing up and it always led to tears. Easiest way to see what someone is made of, see how they react to the various stages of a board game. (Poor winners can be as bad or worse than poor losers). So yeah, games have always fueled my creative garden. I can’t count how many characters I have created specifically for fiction that didn’t have their basis in some game’s parameters. Mr. Gygax knew what he was doing when he gave us the base stats for DnD characters. It’s a thing that helps to cement reality of a world for me. And now I go in a slightly different direction. I figure you have to realize how much of the mental work I am not unpacking as I write this. When I first thought about what I might say in this all manner of images and wild tangents popped up. We could be going down a huge number of rabbit holes but I don’t know if it would ever lead to an actual point. Mind you, I am still not sure what the point I have been working toward this morning is. But, I wanted to spend a few minutes talking about something to do with technological changes. This is where we will venture now. Like I said, I have always spent quite a bit of time buried in various game worlds. The one that comes to mind is linked to current reading. To take it back I want to go back to the late 80s and early 90s. A game had come out back then called Cyberpunk 2017. 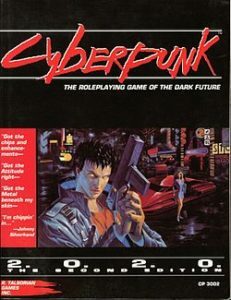 It happened to be based on the fictional genre that emerged around then with books like Neuromancer and others of the kind. The premise was built around the drug war of the 80s with a huge bend toward emerging tech. From a geek’s stand point the tech that they created and showcased not only in the books but specifically in the game was cutting edge and amazing stuff. We were looking at science fiction material we thought might never be achieved in our lifetime. Or if it was, it wouldn’t be for many years. And we pictured a world far different than the one we inhabit today. And this is the problem. Neither the world imagined nor the tech came about exactly as predicted. I have been sifting through the Cyberpunk 2020 core book (basically the second edition of the first game). The tech is so outdated and silly that it is hard to imagine that this is where we thought we would be at in this moment in time. I mean, seriously, we are currently living in that future predicted back then. And we still don’t have flying cars! It’s crazy. The amount of tech in an Iphone 5 (yes, I know we are beyond that in either of the big companies. That’s part of the point) completely blows away the stuff from stories like Johnnie Pneumonic and other stories from those early days. I have been looking at things like internal recorders for both film and audio in the cybernetics section of the book and trying to remember the last time we did anything with audio tape or even video tape. The amount of information that moves from streaming is worlds ahead of what they thought they could do with wired communication. From my viewpoint, it means digging through different layers of tech and oddity as I try to figure out the changes once expected from the reality we have grown into. How will this affect our future? And what does it mean for the stories that will grow from these humble beginnings? It’s all something to think about. I don’t know about you. I still spend a decent amount of time watching various medical documentaries and such that share the changes and discoveries of cybernetics and the possibilities we are uncovering even now. Some of this stems back to what our thoughts were 20 and 30 years ago. And some of them lead us to a bigger future than we can even imagine now. Sometimes, it can be easier to play within the realms of fantasy where things feel more set in the stone of the past. There isn’t as much of a worry that technology and the oddity of people will outpace the thoughts you once carried about the future.